BB and CC creams (and even DD creams now!) have been all over the place lately. I've tried my fair share of BB creams, but this is my first foray in to the world of CC creams! According to Studio Gear, their Hydrating CC Cream is supposed to fight aging, hydrate the skin and cover and treat blemishes. This formula contains collagen-building ingredients to help prevent fine lines and wrinkles with use. This "foundation" (not how I would refer to it, but it is how Studio Gear refers to it) comes in three shades: Linen, Natural and Wheat. The shade I'm featuring is Natural, which is just a bit too dark for my uber-pale skin tone. Luckily, this formula does blend out well enough for me to wear it without looking crazy. The Hydrating CC Cream is just that - hydrating. It feels very light on the skin and moisturizes without being too thick or oily. When dispensed, this CC cream starts out white and gradually transforms to a skin-toned color. I have to admit, the first time I applied it I was nervous because the color was much too yellow-tan for my skin, but as I let it sit the color melded with my skin-tone really nicely. While Studio Gear refers to this cream as a "foundation" - I certainly wouldn't go so far as to call it that. It feels more like a primer, or light-wearing cream used solely to even out skin-tone while still appearing very very natural. It provides extremely light coverage and can be built up some, but probably just to a medium coverage (I can't build it too much as the color is not exactly right for my skin). Below you'll see what it looks like before and after application. Before you'll see I have some redness and a couple blemishes. 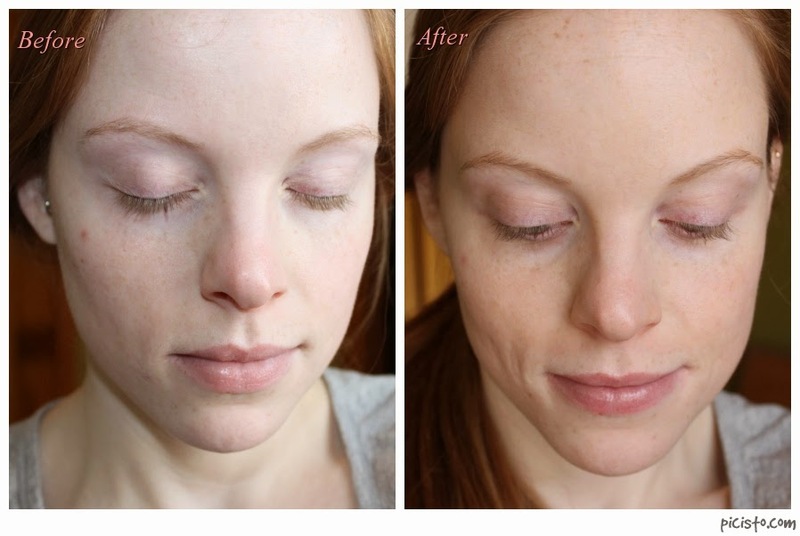 After application, my skin-tone does appear more even and blemishes look smoother and less noticeable. I really like the Studio Gear Hydrating CC Cream. I think I'd love it even more if I had it one shade lighter, but that's beside the point. This cream applies really nicely and noticeably evens out skin-tone - reducing redness and the appearance of fine lines. I wouldn't use this to achieve a flawless, full-coverage face, but I would use this to moisturize and prime my face prior to applying foundation. This CC Cream is Glazed-Over approved! Studio Gear Hydrating CC Cream is available at www.studiogearcosmetics.com, and retails for $34. Glazed Over readers can receive a 10% discount using discount code SGCC at checkout!